Chuck Downey, of Poplar Grove, Ill., lived through 17 bombing missions, two kamikaze attacks and the sight of several friends being shot down by the enemy – all as the youngest Naval Aviator of World War II. For years, former President George H.W. Bush, a TBM Avenger Torpedo Bomber pilot, thought he was the youngest Naval Aviator of the war. But Downey has the President beat by 11 days, a fact the President has since acknowledged. Today, Downey is nearly 89 and still going strong. 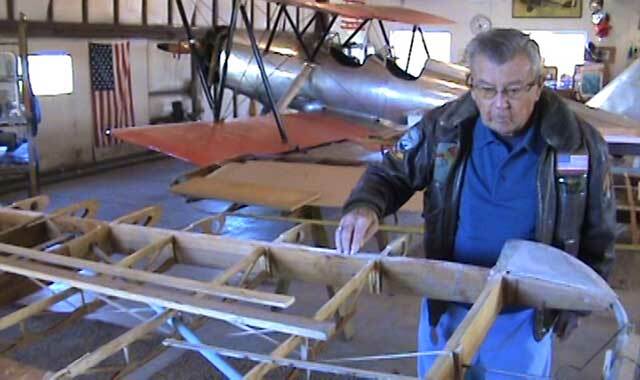 By age 7, he was making airplane models out of balsa wood; by age 16, he was a champion model builder. This was good preparation for his first flight, in 1934, out of Brainard Field, circling Hartford, Conn. “It was against my father’s wishes, but I went up with my mother in the drafty, cold, front cockpit of an OX-powered Waco 10,” he recalls. By the late 1930s, Japan had invaded China, Germany had invaded Poland, and the U.S. was forced onto the threshold of World War II. After the Dec. 7, 1941, Japanese bombing of Pearl Harbor, Hawaii, in a surprise air raid, Downey was eager to join the country’s armed forces. He wanted to sign up before his 18th birthday, but needed signatures from both parents, and his father wouldn’t sign. After turning 18, he joined the Navy in October, 1942. Surprisingly, he wasn’t hoping to become a pilot; he wanted to enlist as an aviation mechanic. “But they [the Navy] said I had different skill levels and I was a good candidate to be a Naval Aviator,” he recalls. Off he went for training in Memphis, Tenn., before heading to Pensacola, Fla., for flight school, where he was commissioned as an Ensign in the U.S. Navy on July 16, 1943. Downey was the tender age of 18 years, 11 months and 14 days when he earned his wings. In September 1943, Ensign Downey headed to Glenview Naval Air Station, near Chicago. The Navy had transformed two coal-burning luxury excursion ships into makeshift carriers that plowed the waters of Lake Michigan, in order for new pilots to earn carrier landing qualifications. The ‘carrier’ decks were only 550 feet long, much shorter than those of actual carriers that saw duty in the Pacific. Learning to land on them was very difficult, which is why more than 150 Navy aircraft now lie on the bottom of Lake Michigan. Downey couldn’t believe his eyes the first time he approached a practice carrier. “You mean I have to land on that thing?” he thought, as he viewed the tiny deck. But land he did, qualifying himself to see action in the Pacific. In June 1944, Downey first saw combat duty as a dive bomber pilot aboard the newly commissioned aircraft carrier USS Ticonderoga. 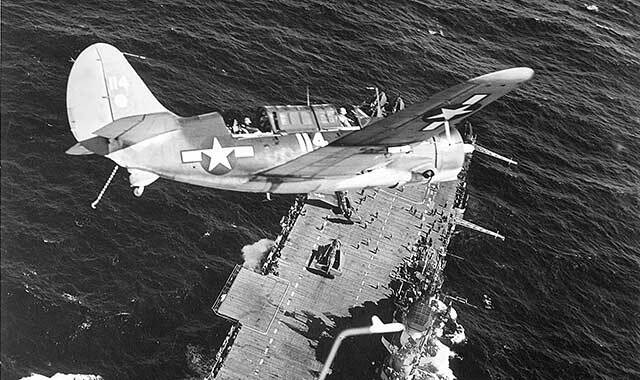 He flew the SB2C Helldiver, a plane so difficult to fly that some pilots dubbed it “Beast.” It had just replaced the beloved Dauntless dive bomber, which had a proven record of success, including the sinking of four Japanese aircraft carriers in the pivotal battle of Midway. But Downey wasn’t intimidated by the Helldiver. One of his most successful – and most dangerous – combat missions took place on Nov. 13, 1944, at Manila Bay in the Philippine Islands. As a LT. J.G. at the time, Downey was part of an air group that sank the Japanese light cruiser Kiso, a mission that taught him just how quickly one’s life can end in combat. Perhaps Downey’s closest encounter with death came during a bombing run against a Japanese destroyer on Jan. 12, 1945. It took place at the mouth of the Saigon River in Indochina, a country now called Vietnam. He was flying low, to increase the chances of his bomb hitting the target. “Destroyers are kind of skinny – only about 35 feet wide,” he explains. “I went down to about 800 feet.” The standard bombing altitude was about 1,200 to 1,500 feet. Despite losing oil, Downey did make it back to his secondary ship, the aircraft carrier USS Essex. After being waived off the first time he approached, he eventually landed without incident. Downey would take part in several other crucial combat missions during the final year of war in the Pacific, including the invasion of Iwo Jima, a Japanese island stronghold that saw one of the bloodiest battles of World War II. He flew his Helldiver in ground support missions for the Marines, slugging it out, especially near the towering inactive volcano Mt. Suribachi. Later, in 1945, Downey was awarded the Air Medal for taking part in the first carrier-based dive bomber raid on mainland Japan. His bomb helped to destroy an airplane hangar near Tokyo. It was one of the bombing missions that stands out most in his mind. Carrier pilots serving in the Pacific were in great danger, whether or not they were flying combat missions in their airplanes. Their carrier ships were under constant threat of attack by Japanese suicide pilots, called kamikazes. Downey experienced such an attack on Jan. 20, 1945, when his ship, the aircraft carrier Ticonderoga, was hit by a kamikaze 80 miles off the coast of the island of Formosa, in the China Sea. Downey was with fellow pilots in the carrier’s Ready Room, waiting to be briefed for the afternoon mission, when the kamikaze hit the carrier, about 50 feet from the Ready Room. Downey and his fellow pilots put on their gas masks in order to survive the intense smoke, which was blinding them. They made their way to safety by walking out single file, each man hanging on to one in front of him. Kamikaze attacks, bombing missions, close calls – Chuck Downey experienced all of this as a teenager, the youngest naval aviator of World War II, although he didn’t know it at the time. For years it had been reported that former President George H.W. Bush was the youngest Naval Aviator of World War II. He had flown the TBM Avenger torpedo plane in the Pacific and was shot down during combat. But records show that he was six days shy of his 19th birthday when he got his wings, while Downey was 17 days shy of his 19th birthday, making Downey the youngest Naval Aviator by 11 days. That fact wasn’t discovered until long after the war, when the editor of the naval magazine Golden Wings reached out to readers to see if there was anyone else who was a younger World War II Naval Aviator than Bush. Downey says that when his record was discovered, then-Vice President Bush sent him a nice card acknowledging Downey’s status. Many years later, when they both turned 80, the former President sent Downey a letter wishing him a happy birthday. “Of course I’m proud of it, oh yes. But you don’t walk around with it,” Downey says. “I think a lot of people attach more importance to it than I do.” He adds that he still hopes to meet the former President one day. Downey retired from the Navy in 1975, at age 51, after holding several command positions. He then enjoyed a successful career in the world of commercial aviation, serving as an executive for American Airlines, Commuter Airlines, Butler Aviation and Midway Airlines. Despite his military and civilian successes, Downey is proudest of his family. He married wife Lorna in 1951 and has five children. The couple had 45 wonderful years together before Lorna died in 1997. Downey loves spending time with his eight grandchildren. Even though he won’t fly “solo” anymore, Downey still intends to fly as an observer or passenger. Today, Downey spends winters at his Florida condominium, and summers at his Poplar Grove home, which has a hangar and is on the flight line of a small airport. At both locations, he pursues his passion for restoring vintage aircraft. Some are from World War II; others are even older. Downey has been hard at work restoring a Meyers OTW (Out to Win), a pre-World War II biplane trainer. He uses the same woodworking skills that he developed as a 7-year-old boy making model airplanes out of balsa wood. Editor’s Note: Bob Ryder is a former Marine sergeant who served in Operation Desert Storm in Kuwait and Saudi Arabia and was awarded the Joint Service Achievement Medal for his service as a combat correspondent and broadcast journalist with the Armed Forces Desert Network. He’s an award-winning member of the Marine Corps Combat Correspondents Association. Ryder also worked as senior reporter and substitute news anchor for WTVO, Rockford, for nearly 20 years. Today he’s a communications specialist at KMK Media Group, Rockford. This entry was posted on Monday, July 1st, 2013 at 11:59 am	and is filed under Features, Top Posts. You can follow any responses to this entry through the RSS 2.0 feed. Both comments and pings are currently closed.